Definition: “Binaural beats” are specific kinds of sound that can shape our brain activity to boost our concentration, enhance our creativity, and improve our mood. A binaural beat is an auditory illusion perceived when two different pure-tone sine waves, both with frequencies lower than 1500 Hz, with less than a 40 Hz difference between them, are presented to a listener dichotically (one through each ear). Forty-five years on, and a heap of research by scientists and sound engineers later, the science of binaural beats (brainwave entrainment) is used by people all over the world to entrain the brain into different states that contribute to stress relief, focus, aiding sleep, pain relief and much more. The 5 Binaural Beats Brainwave States: The neurons in our brains use electrical signals to create our thoughts, emotions, and behaviors. When large numbers of neurons fire together with the same rhythm (“synchronize”), this creates brain waves. Brain waves can be measured with the use of electrodes on the scalp to record electrical signals, a technique called electroencephalography (EEG). Delta Waves (0.5-3 Hz): slow, loud brain waves associated with dreamless sleep, deep meditation, and healing. Theta Waves (3-8 Hz): brain waves related to dreaming, spatial navigation, intuition, meditation, memory formation, alertness, creativity, and subconscious thinking. Alpha Waves (8-12 Hz): the quiet resting state of the conscious brain, associated with working memory, calculations, and the coordination of thoughts. 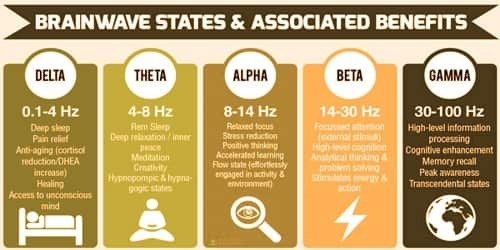 Beta Waves (12-38 Hz): associated with active problem solving, complex and effortful thinking, motor control, high anxiety, excitement, and judgment. Gamma Waves (38-100 Hz): the least-understood brain waves, believed to be involved in the integration of thought processes by linking information from different parts of the brain, active consciousness and self-awareness, peak cognitive functioning, and possibly spirituality. It is important to remember that at any given time, there are varying levels of each of these brainwave patterns occurring in our brain. 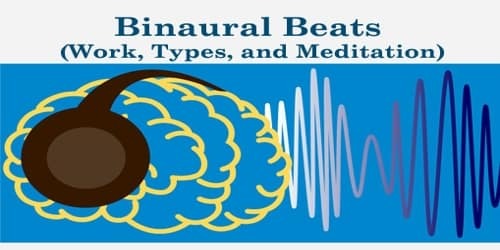 Binaural Beats Meditation: ‘Binaural beats meditation’ has become a common term for listening to binaural beats music. This may seem a little confusing because not all binaural beats music is designed for meditation and relaxation. In a similar way to meditation, a lot of binaural beats music is designed to entrain the brain in a similar way to that of meditation, which is referred to as mindful awareness, or entirely in the present moment. Generally speaking, binaural beats music is accompanied by ambient, relaxing music, which is usually quite similar to the sound design used in meditation music. As in meditation practice, when listening to binaural beats, some people choose to sit in the traditional lotus meditation position because it is conducive to attaining a relaxed, centered state of mind. This state is also conducive to entraining the mind. 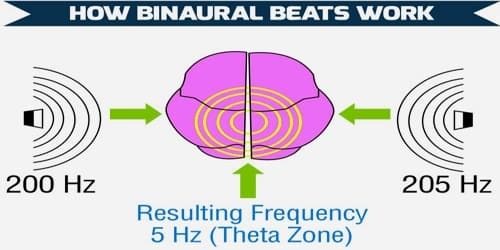 Rather Binaural Beats is perceived as an auditory beat and theoretically is being used coach certain brain rhythms from what is called the frequency-following response (the tendency for the brain to resonate at the frequency of an external stimulus).